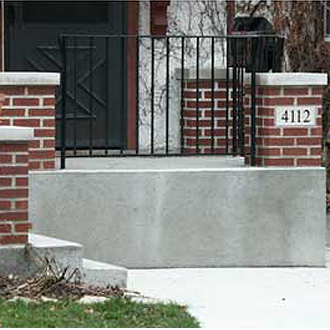 Entry features three types of granite random flagging in mortar, with rounded risers and burnished outcropping. 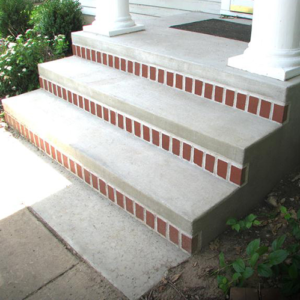 We installed all new footings for this stoop. 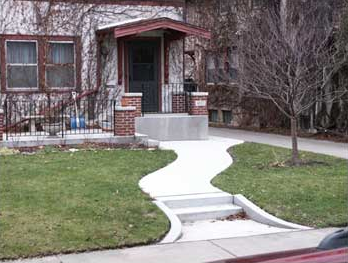 The owner got tired of mowing the little hill along the city sidewalk and also wanted to “jazz-up” the look of the walk to the front door. 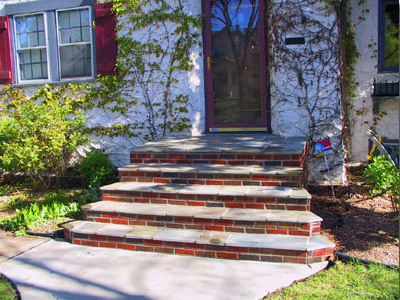 The front steps feature a rounded design riser set with a straight riser band across the door front. The sidewalk flares to meet the wider stoop. 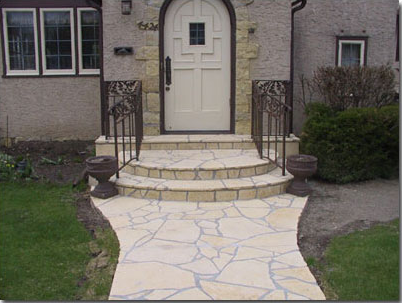 The combination works very well and the stone color is picked up on the old accent Dolomite bed face around the front door. 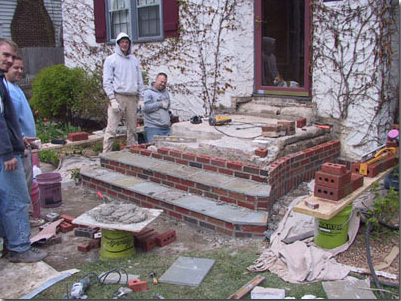 The crew is working on the front entryway. some of the bluestone caps have been set on the lower two risers. The finished product is a huge improvement to the first impression of the house. the face brick colors are picked up in the door and windows. 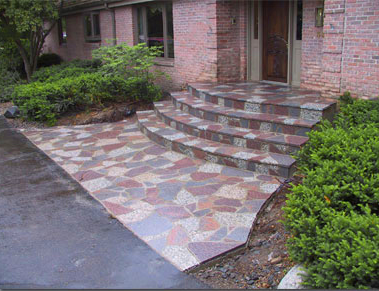 the ny bluestone has a unique beauty of it’s own, it lends itself well in many applications. 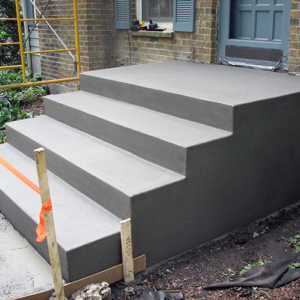 we installed a new concrete slab in front of the new stoop. 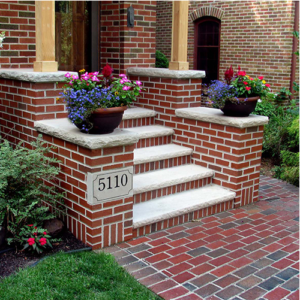 This stoop was designed with Black Shale face brick on the risers and buttress. The tread stone and the matching caps are MN dolomite, rock faced edges on the buttress caps and smooth cut on the riser edges. Sorry about the obscured view, but by the time I returned to take the photo the owner had really went wild with the plants. 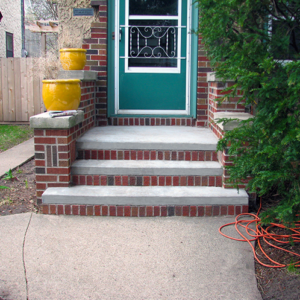 We removed all the old concrete work (there used to be tall concrete walls around the step layout with so many vines you could not see much of the house), installed new footings, then all new concrete work including: steps, runners, sidewalk, stoop, patio, pillars caps, matching address stone. If we only had a before picture. This job was done before the days when we took pictures of everything. 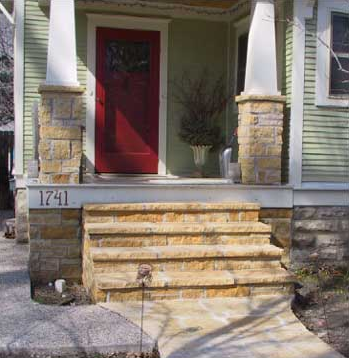 This older St. Paul house had the room for an old style porch with fancy stonework, pillars and steps, but nothing was there but an 8×12′ dirt area with some rickety old wooden steps up to the front door. 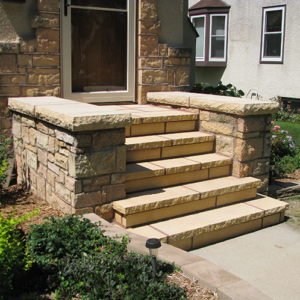 We installed full frost footings, new random sidewalk steppers in mortar leading up to the new all natural stone steps, pillars and walls. 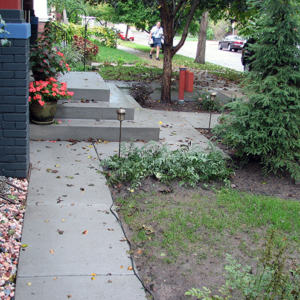 We topped it off with a new exposed aggregate sidewalk from the front to the back. Job is located in St. Paul.